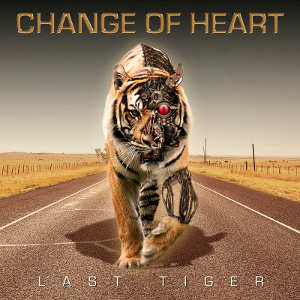 North East of England base melodic rock band CHANGE OF HEART will release their new album “Last Tiger”, following up the album “Continuum”, through Escape Music on July 22nd. It contains 11 songs and is laden with hooks and melodies. Produced and mixed by Paul Hume (vocalist of LAWLESS) at Summer Bank Studio in the UK and executive Producer is Khalil Turk from Escape Music Ltd. Their debut album was released in 1998, since then, the brainchild, vocalist, guitarist and songwriter, Alan Clark has always been walking along with the band as the core member. In 2005 an album called “Truth or Dare” was released and this was a very strong release that saw the band mature in a fine melodic rock band that would challenge many of the UK’s finest rock bands treading the boards at the time. Currently line-up are Alan Clark on lead vocals / guitar, Nick Catterick on lead guitar / vocals, John Sykes on keyboards / vocals, and Jeff Hopkins on bass / vocals. On this album, Sam Ogden on Drums and Paul Hume on Guitar / Backing vocals appear as guest musicians, and it turns out they make a large harmony. For all fans of melodic rock, AOR such as Queen and ELO.